WASHINGTON, DC, December 13, 2011 (ENS) – The Washington Gas Light Company has agreed to begin clean up of a polluted area along the Anacostia River in southeast Washington, DC, the U.S. government and the District of Columbia announced Monday. 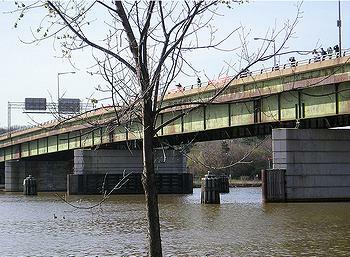 The property, near the 11th Street Bridge, was formerly managed by the National Park Service and owned by the United States, and is now owned by the District of Columbia. The settlement was reached between Washington Gas, which once manufactured gas adjacent to the polluted area, the Department of the Interior and National Park Service, the Environmental Protection Agency and the District of Columbia. “This settlement provides for the cleanup, cost recovery, and comprehensive investigation of historic contamination by manufacturing activities at the Washington Gas Light Company’s East Station Facility,” said Ignacia Moreno, assistant attorney general for the Environment and Natural Resources Division of the U.S. Justice Department. Washington Gas manufactured gas from coal and oil at the East Station Facility from 1888-1948 and then intermittently until the mid-1980s. By-products and wastes generated by the gasification process included polycyclic aromatic hydrocarbons, volatile organic compounds, and other contaminants and hazardous substances including benzene, arsenic, heavy metals, tar, oil, coal, lampblack, and coke. The East Station Facility was demolished in 1986, and aboveground oil storage tanks were removed in 1997. The National Park Service property along the river is used principally by the District’s Department of Public Works, Street Maintenance Division, to store and maintain heavy equipment. A small portion of the Park Service property located under and east of the 11th Street Bridge is accessible to the public and mainly used by a rowing club. The 18.8-acre parcel once owned by the U.S. Army Corps of Engineers is adjacent to the river and was used as a staging area for the removal of floating debris from the Anacostia and Potomac rivers. Since 1976, Washington Gas has been pumping and treating groundwater to remove dense non-aqueous phase liquid and dissolved organic constituents. Removing these contaminants will accelerate remediation of the site and reduce toxic plumes that still pollute the Anacostia River. In 1993, Washington Gas installed a new groundwater treatment facility office building on the East Station property. Under the settlement, Washington Gas now must excavate and remove from the edge of the Anacostia River up to three feet of contaminated soil and subsurface soil covering the portion of the site that is government property. Washington Gas also will pay for an investigation of groundwater and sediment contamination caused by its gas plant and determine if groundwater is an ongoing source of contaminants to the river. Cleanup of contamination in groundwater and sediments in the Anacostia will be addressed in a future settlement or enforcement action when actions to remedy that contamination have been selected by the National Park Service. “Today’s agreement is a milestone for our efforts, in partnership with the District of Columbia, to transform what was once known as America’s forgotten river into a model urban park,” said Secretary of the Interior Ken Salazar. The Anacostia Riverwalk Trail is expected to traverse the site once the cleanup is completed. In addition to investigation, remediation and oversight costs, the settlement requires Washington Gas to pay $500,000 to the NPS, $160,000 to EPA and $70,673 to the District to reimburse the agencies’ costs in investigating the site and associated enforcement costs. The settlement stems from an investigation conducted by the National Park Service to address contamination that had migrated on and under NPS property adjacent to the East Station Facility. The investigation found that surface soils, subsurface soils, groundwater and Anacostia River sediments are contaminated with coal tar, heavy metals and other pollutants. National Park Service Director Jonathan Jarvis hailed the settlement agreement as an effective collaboration between government agencies to require the party responsible for pollution to be accountable for the costs of cleanup. “The National Park Service has worked closely with our partners to ensure that this agreement will protect the Anacostia River from further contamination resulting from past operations at the Washington Gas facility, at no cost to taxpayers,” Jarvis said. The settlement sets the stage for the acceleration of efforts already underway to restore the Anacostia River watershed, including several projects to reconnect area residents and visitors to the natural world. In addition to cleaning up the Anacostia property, Washington Gas announced December 1 that the company is aiming for a 70 percent reduction in greenhouse gas emissions from its fleet and facilities operations by 2020, compared against a 2008 baseline. The company will utilize natural gas and LEED Gold building standards in its new office and operations center in Springfield, Virginia, and will continue to deploy energy efficiency improvements at multiple satellite stations within the Washington Gas service territory. Other greenhouse gas reductions will come from the continued deployment of natural gas vehicles that, on average, have a 25 percent smaller carbon footprint than similar gasoline-powered vehicles. Washington Gas also plans to take action to reduce greenhouse gas emissions from its gas delivery system.